If you think your smile is too yellow or dull the dental professionals at Hill Davis Dental Group can help you get a brighter smile with our take-home teeth whitening kits. What Can Cause Tooth Stains? One of the primary reasons teeth may get stained is drinking beverages such as wine, coffee, and cola, and eating foods such as curry, chocolate, and berries. The whiteness of your smile may also be affected by Aging, Plaque, Trauma, Tobacco, Heredity, Decay, Infection and even Root Canal Procedures. At Hill Davis Dental Group in Lubbock, we offer the convenience of teeth whitening in your home. We provide the custom kits, with individually created molds and professional-grade bleaching gels. 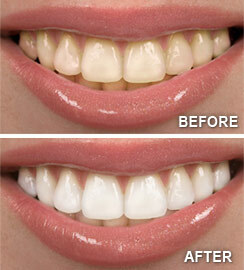 With our take-home teeth whitening kits, you can brighten your smile up to eight shades. Make your smile radiant again! Call our Lubbock, TX dental office today to schedule a teeth whitening appointment or ask about personalized whitening kits.